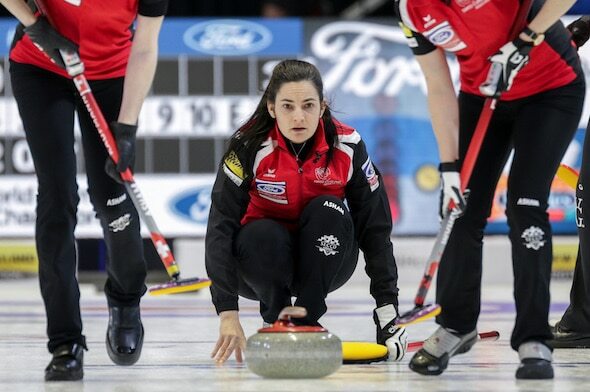 Kim committed a hog-line violation – which activates a red light on the stone – with her final rock in the 10th end, allowing Binia Feltscher of Switzerland to steal two for an 8-6 victory at the North Bay Memorial Gardens. 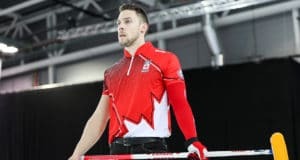 Switzerland (4-5) jumped into an early lead with three in the first end but South Korea scored singles in the next three ends and a deuce in six to grab a 5-3 lead. The teams traded singles in the seventh and eighth before the Swiss scored two in nine and then the steal in 10. 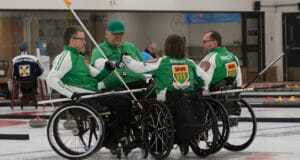 Feltscher, Schori, second Franziska Kaufmann, lead Carole Howald, alternate Raphaela Keiser and coaches Al Moore and Manuela Netzer kept alive their narrow hopes of making the top six and qualifying for the playoffs. But they weren’t overly confident even after tying the game in the ninth. South Korea let Kim’s red-light stone slide and it ended up on the edge of the button, but it was for naught. The South Korean loss ensured that Canada’s Jennifer Jones (9-0) is assured of a top-two finish and a bye to Saturday’s semifinals. In the other afternoon games Yilun Jiang of China (4-6) defeated Diana Gaspari of Italy (2-8) 7-5, Jamie Sinclair of the U.S. (5-4) pitched a 6-0 shutout of Angelina Jensen of Denmark (3-7) and Daniela Jentsch of Germany (2-7) stole one in the extra end for a 3-2 win over Anna Kubešková of the Czech Republic (5-5). Jennifer Jones of Canada (9-0), Anna Hasselborg of Sweden (9-1), Victoria Moiseeva of Russia (6-3), Tori Koana of Japan (4-5) and Hannah Fleming of Scotland had the afternoon byes.